Swim Team welcomes swimmers of all abilities. Training is at your own pace and competing at Club, County, District & National levels. Swim Kids is the perfect introduction to the water for kids aged 3 up. With fun activites & small classes, they are guaranteed to learn a love of swimming! For children aged 8 -14 years who like swimming but do not wish to commit to more than one session each week. Fun, friendly and enjoyable. Can babies swim? Yes, they can. Join us and we'll show you how to teach your baby to swim underwater. Box Hill is a relatively young club founded in January 2005 by former Olympic Coach Conrad Cawley. Unlike many swimming clubs Box Hill does not have a home and use several school pools in and around Guildford and Leatherhead. Our motto is Semper Diversus - which means Always Different - We are proud to be different. swim using the correct technique. Our purpose is to teach and coach all swimmers regardless of ability and help them achieve realistic goals. 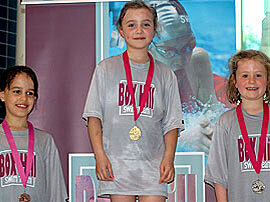 We have recently added Swim Active to the already highly successful Swim Academy and Swim Team. Swim Active is for Kids who love the water but are not keen to take part in formal training but just swim once a week. Box Hill SC is a fantastic place to teach or coach swimming. We are always looking for people who are keen to embrace the Box Hill way and join us poolside. If you are intersted in working in a friendly enviroment alsongside some great people then get in touch. Order Swim Hats - Click HERE.